This was a struggle to finish. It was really not that good. We had Hand and Ashton taking on Jane Eyre and deciding to include ghosts. The characters of Jane and Mr. Rochester were blah and the way that the book ended made me want to pull my hair. There is enough dropped here to show that this and book number one are taking place in the same timeline/world though. 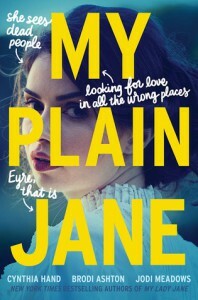 "My Plain Jane" deals with the character of Jane Eyre and author Charlotte Bronte. No I don't know why they incorporated them both in this book, I just know that it doesn't work very well. So we have have the book falling Jane Eyre except for a few new characters and of course we have ghosts. Jane is just lifeless for me in this one. I loved Jane Eyre because she and Mr. Rochester just made sense. The whole story worked for me from beginning to end. I don't even want to go with what Hand and her fellow authors decided to change up, but it got a lot of readers fired up. I haven't read any biographies about Charlotte Bronte, so don't know how realistic she was portrayed in this one. The friendship between Jane and Charlotte didn't work and the other characters were unimportant. I think if they had kept it to just going back and forth between Jane and Charlotte it would have worked a bit better. Instead the story zig-zags between them and Alexander Blackwood (supernatural investigator). The writing was okay, I didn't laugh at all while reading this unlike when I read the first book in the series. The flow isn't great either. This whole book drags and even when we do get some movement/action it takes forever for the story to just sort itself out.